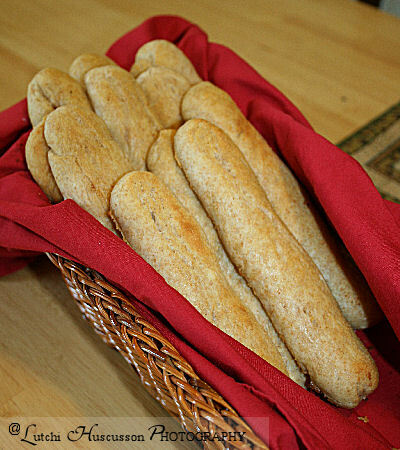 I made some garlic bread sticks to go with my pizza for lunch today. I didn't have any marinara sauce with it but it was still very good.I don't have any special recipe for garlic bread sticks so if you like it garlicky, crispy in the outside and soft in the inside then this recipe is for you. I am pretty sure your family will like it. 1. In a bowl, combine salt, oil, sugar, whole wheat flour, all purpose flour, and yeast. 2. Slowly add water to the mixture to form dough. 3. Knead into soft dough. Let rest for 10 minutes. 4. Spray your hands with a little bit of oil to avoid the dough from sticking. 5. Lay the dough in the floured surface. 6. Knead gently and stretch to make a log. 7. Using a dough cutter, cut log into pieces (1 inch to 1-1/2 inches). 8. Roll each piece into breadsticks. 9. Place prepared breadsticks onto greased baking pan. 10. Brush each piece with melted butter. 11. Sprinkle with garlic powder on top. until the size is double. 13. Take the pan of breadsticks out from the oven. 15. Bake for 12 minutes. 16. Brush on more butter. Best when serve warm. 0 Comments On "Garlic Breadsticks"